Purrrlock Holmes is on the case and he’s going International! 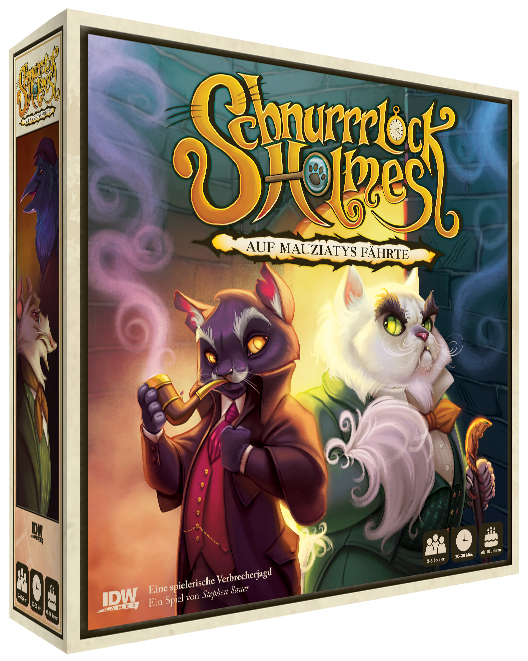 San Diego, CA (January 30th, 2018) IDW Games and Asmodee International to announce Purrrlock Holmes: Furriarty’s Trail will be available in multiple languages. This game of social deduction and chase the cards will be available in Spanish, French, Italian and German. Furriarty is terrorizing London and it is up to Purrrlock Holmes to stop him before he completes his plans and escapes! However, Purrrlock cannot do it alone and it is up to you, as a newly inducted Inspector at Scotland Pound, to bust members of Furriarty’s gang in order to help Purrrlock get closer to the bewhiskered baddie that’s been bullying all of Baker Street. Get ready Inspector, the game is officially afoot. This chase the case card game from Stephan Sauer is ready to find its way into stores and on to your game table. 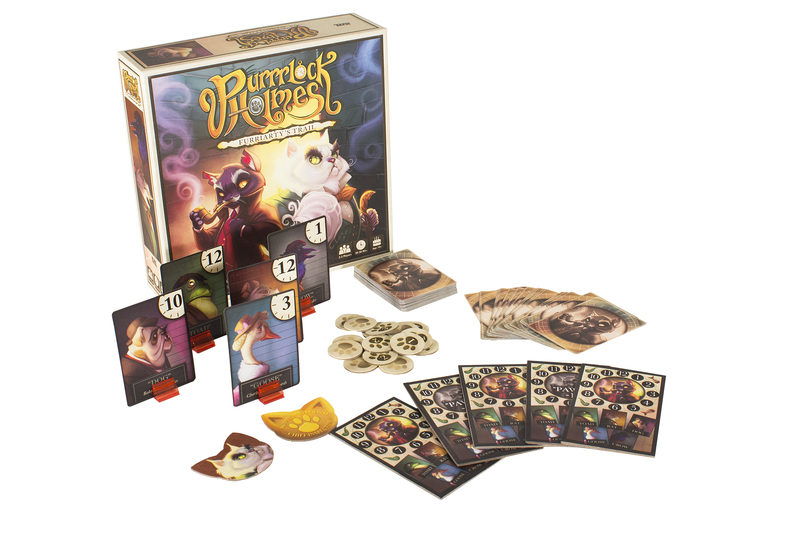 With beautiful art by Jacqui Davis and fun gameplay by Stephen Sauer, be sure to pick up Purrrlock Holmes: Furriarty’s Trail. Available in Spanish, French, Italian and German, Purrrlock Holmes: Furriarty’s Trail, from IDW Games and Asmodee International. French release will be in January 2018. Asmodee Group is a leading international games publisher and distributor with operations located in Europe, North America, and China. Asmodee’s best known titles, either published or distributed on behalf of key publishing partners, include Catan, Ticket to Ride, Splendor, Dobble/Spot It!, Star Wars: X-Wing, 7 Wonders, Dixit, Takenoko, Abyss, Timeline, Jungle Speed, and The Werewolves of Miller’s Hollow. In some European countries, Asmodee also distributes trading card games such as Pokémon, Magic: The Gathering, and Yu-Gi-Oh! Asmodee has headquarters in Guyancourt, France. IDW Games’ diverse line-up includes the international phenomenon Machi Koro, as well as hit licensed games such as X-Files, Dragonball Z, the Atari Series, and TMNT. ← Masque of the Red Death Kickstarter Last 24 Hours!